Employee development is key to any company’s success. 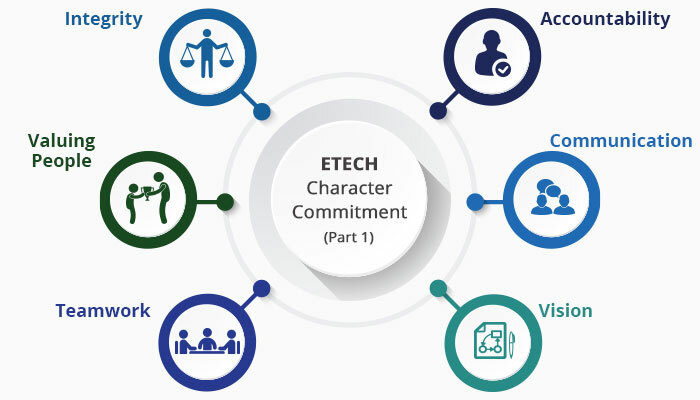 For Etech, this principle forms the cornerstone of its approach to employee relations, which centers on 12 character commitments essential to support effective implementation of servant leadership. Employees need to know they can rely on their leadership and on one another. Fostering a spirit of integrity is the first important step towards building a cohesive, motivated team. This character commitment means delineating your company’s principles and supporting your team in adhering to them. Whether interacting with customers, vendors, co-workers, subordinates or supervisors, integrity is an essential component of building trust. Many companies approach employees as “human resources,” only taking an interest in whether they perform their current tasks. A more foresighted approach is to not only value current contributions but to take an interest in the whole person. Valuing people for the whole range of their talents and potential paves the road to participating in an employee’s development and assuring long-term success. An effective team is vital to maintaining productivity and achieving goals. The principles of servant leadership demand attention to developing teamwork that goes far beyond each employee performing his or her assigned tasks. Real teamwork happens when each employee understands the role of his or her functions within the larger picture of the team and of the entire company. Rather than mechanically repeating a set of actions, employees who work as a true team cooperate intelligently to reach goals they are invested in. A core character commitment, accountability builds relationships and enhances teamwork. It completes the balance between working together as a united team and taking individual responsibility for one’s own role. Accountability at all levels boosts trust between employees and leaders. Unlike the popular conception, accountability does not just mean accepting blame for when things go wrong. Rather, it is an expression of a personal relationship to one’s work and an understanding of one’s responsibility to the team. It is possible to exchange words without achieving communication. All too frequently, words are used to obscure, deflect or confuse. Communication as a cornerstone of servant leadership, on the other hand, means establishing honest, informative exchanges of ideas. On a logistical level, this can mean company managers may need to review processes to ensure there are protocols in place to enable employees to share information efficiently. On a more general plane, it is important to establish a setting of trust and cooperation that encourages needed communication. All too often, company leaders get caught up in short-term goals. They make the mistake of focusing on meeting today’s goals at the expense of long-term vision. However, it is essential to keep in mind that the short-term tasks are important because they further long-term organizational objectives. Vision is essential to effective leadership, as it enables managers to make strategic decisions and build relationships with their teams. If the above sounds like a lofty challenge, using the right resources can help. AI solutions can aggregate and analyze data to identify areas that would benefit from improvement, as well as paths towards achieving it. Using AI performance analytics in conjunction with the Etech character commitment can help employees attain their full potential.